BYS: PROJECT: We will send a short letter to B.A.P, concerning their fans. Please show support! PROJECT: We will send a short letter to B.A.P, concerning their fans. Please show support! This is actually not an usual fanletter. I know that you guys are tired and don’t have time to read all these letters, so I’ll make it short. But please, read this until the end. Anyway, at KBS, at the Olympic Hall and at TS Entertainment, I’ve heard and seen some things that really scared me and make me worried about you. I didn’t know how was the fans here, how they do everything to touch you, talk to you, or take thousands of pictures of you at 2cm of your faces for their fansites. When I went to TS Entertainment, one of the members and I got hurt because of couple of fans who were ”fighting” to get closer to B.A.P. Some of them even followed your van to find the dorm, and I’m sure that it’s not the first time that these kind of things happened, right? I don’t like these kind of behaviors, and I think that you deserve better than this. You guys are getting very popular, and as a staff of your international fanbase, I know what I’m saying. But I hate the fact that the more your come popular, the more it’s hard for you to keep your privacy and to not be followed all the time. I know it’s hard emotionaly and physically, and it will be worst in the coming years. However, I want you to know that 80% of the fandom aren’t these kind of fans. I will personally do my best to tell people that they should support you with all their soul when you are on stage, get excited and yell ‘B.A.P’ to show everyone how B.A.P is awesome – And let you breathe and live normally when you’re just coming out of TS building or walking in airports. Because after all, you are humans like all of us. And you deserves more respect. Here’s more than 500 International BABYz from more than 30 countries that think that you guys deserves more space and respect and think that you guys should be able to walk in peace without getting touched or pushed - We couldn’t reach all BABYz in the world, but we’re sure that most of them will agree with this as well. ... And then all the names & countries were listed below. I hope they will receive the letter soon and that it will make them feel better. I'll explain myslef. When I went to TS Entertainment to give a package to a manager / TS Staff, there was already a lot of fans who were waiting outside. But around 11PM, there were a lot more fans. A friend from France told me that two of them were the founders of famous B.A.P fansites. These kind of fans know everything about the boys - They somehow find every schedules - When they are coming to TS, when they are leaving, etc. Around 12AM, we were EXHAUSTED and VERY COLD, so we decided to leave, cause we weren't able to give the fanproject to any staff member, and we didn't wanted to enter TS' building to leave the package even if the doors were unlocked >< But as soon as we get up to leave, B.A.P van arrived. Jongup, Zelo and Daehyun get out of the van and -tried- to enter the building. Like always, the fans were all around them, trying to touch them and get attention. Zelo had very big troubles to enter the building, but it was kind of 'normal'. It was my first time to see them that close and it was exactly like on all the fancams I've seen at the airports and such. I personaly think that these fans should give them more space. Not trying to block them or whatever. Just let them go wherever they want without necessarily follow them and try to speak with them. I mean, they can watch them from away and let them live. B.A.P members will always be humans beings more than idols. And for them, the fans remains strangers. They don't want strangers to touch them and follow them that close! Anyway ¬.¬ So after they enter the building, Jongup & Zelo went to the elevator, while Daehyun stopped and returned to the van. He was running like there was no tomorrow to avoid the fans. Poor guy. The 3/4 of the fans there tried to follow the van to find the dorm. When they came back, my friend said that she thought they found the dorm. What is the ----, really. How does these fans will appreciate if 10+ strangers would find where they live and then stalk their home to see them even when they shower? The worst part is coming. When Jongup and Zelo TRIED to leave the TS building to go to sleep (it was almost 1:10AM .__. ), two vans stopped in front of two different exits so that the fans get confused. Me and my friends were waiting near the TS' Studio door. And guess what Jongup and Zelo came out by this door. Once again, I tried to give them the fanproject. But then, Jongup and I got hurt by a couple of fans that were kind of "fighting" to get closer to the boys. I could hear him cough like crazy in the car cause I think he got punched in the stomach. Jongup "fell" on me because of the shock, and my back hurted the door of the van, OMG I wanted to die. My whole spine is full of metal screws and rods and my back hurted for almost 1 hour after that. I thought Jongup would die in the van, he was breathless. When I got pushed on the van, Zelo looked at me with a face like "I'm so sorry ._." 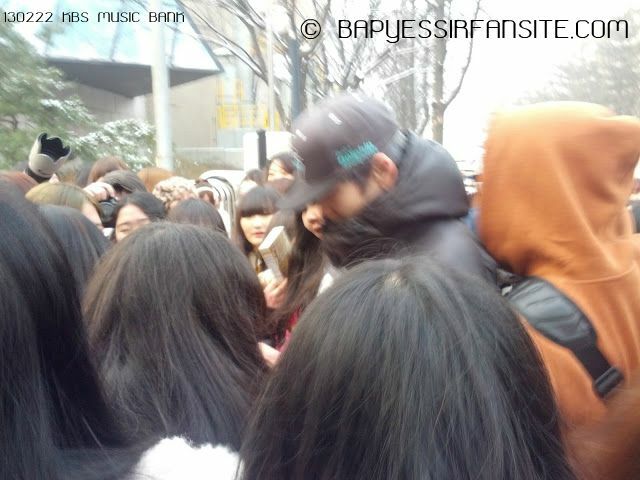 and a fan jumped on him before the manager helped him to enter in the van. ... THEY DON'T DESERVE THAT. I know that every idols groups have these kind of fans. But OMG. Seeing them live is unbelievable. They.Are.Crazy. For me, they aren't fans. At the concert, I've only seen sweet and nice people from Korea and others countries. I didn't even saw some crazy fangirls. Everyone was just calm, but excited to see the concert. I just want them to know the fans that want them to have a life you know - A life where they can breathe and not being followed all the time. This is why I want to send them a letter - Because they probably don't know how 80% of the fandom are sweet and kind fans, that just want the best for them. I don't want them to be scary of their fans you know. Fans should be there as supporters, not stalkers. If you agree with this, comment your name and country below. It will be added in the letter, to show them how many fans want them to live life as humans, not idols that are stalked all day long. -This is so sad and I can't believe some fans are actually like that :( and I'm sorry you got hurt.. Hope you feel better soon! Thank you for this project and fan site! -I'm really upset about hearing this. I hope you are okay as well as Jongup and Daehyun. That seems really painful, and I hate when idols get pushed, stalked, and hurt. Even the fans themselves get hurt like you. :( I wish they just get some space to breathe and relax. Thank you for doing this too. I'm sorry you got hurt !! Those girls really need to stop! I don't know if we have to write our last names so yea.. I'm heartbroken. "Fans" should know their limit. This is sick, I can never understand this. I don't know what more can I say than "no comment". It's just ridicolous how those crazy people call themselves "fans". When I read this, I almost cried. These "fans" is nothing more than unthankful, disrespectful, greedy and ridiculous people who can't get enough. Please show B.A.P some PRIVACY, RESPECT, GRATEFULNESS, SUPPORT, LOVE! Everything that can give them more motivation and joy! Ugh that's horrible, give them some space omfg. :(( poor boys. -True Fans don't stalk B.A.P, they support them! They couldn't ask them to stop since they're BABYS and they didn't want them to feel hurt. BAP love them because they ALWAYS support BAP no matter what happen. But, come on, BAP doesn't say anything about it doesn't mean that the fans can do anything as they wish. Give them some FREEDOM. BAP are the same as us, humans, not a superhero that can survive through any obstacle. And I guess there are not enough words for that "fans". Let's hope their behavior won't cost too much demages to anyone, because it's frustrafing even thinking about such a thing. Hope you will be more succesfull this time and you will be all are right. Fighting! Those fans really need to calm down. Or at least, they should be separate from idoles with some kind of bariers I don't know but some kind of security. It's insane, one day there will be an accident. They're dangerous for them, themselves and others people around. Why are fans like this? Our poor boys must be fearing for their lives out there - they might even have nightmares about such things. OMG...I'm shocked really! Fans should stop that T_T they are also humans and very young hurting them like that is not good! I am really afraid for them right now. I am actually quite upset with my country's B.A.P's fandom's current state too. 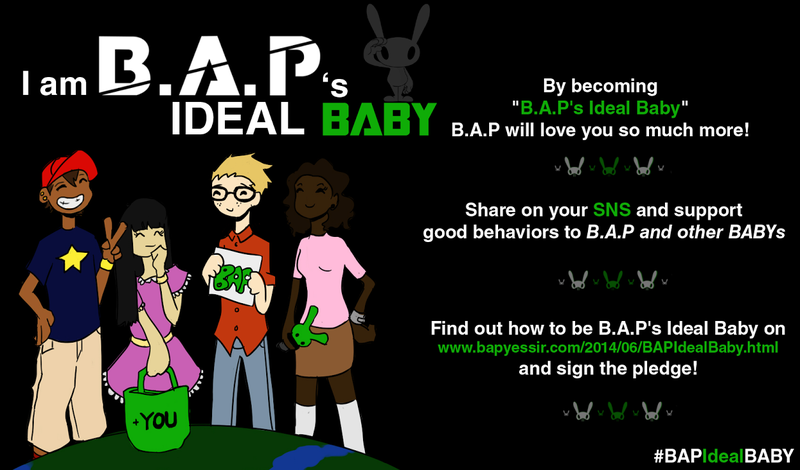 Please make Babys a better fandom. Always be a BABY ! My small BABY fanbase here is good...I think something should be done to not just these sasaeng fans, but all sasaeng fans for other groups. It makes things difficult for idols and sometimes dangerous. I wouldn't want to see this happening for any person. Seriously, B.A.P are only rookies..they don't deserve to be treated like this. Those fans..they can't even be called fans. I know they love B.A.P and all..but how would they feel if they were in our place? How would they feel if they could only see the pictures of the members and think that they are doing well? Overseas fans can't even get 5 feet close to the members but yet when we do see them, we give them space. Seriously, these people need to stop and get a proper life. and I am sorry whatever I said offended anyone. the fans really should stop that. B.A.P HWAITING!!!! ALWAYS SUPPORT U GUYS!!! B.A.P JJANG!!! JJANG!!!! JJANGGGG!!!!!!!!!! ^___________^ BERUSAHA!!!!!! !